I thought magazines were dead and then I discovered this launch in New York. 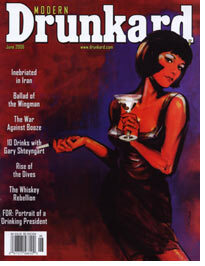 A magazine for everyman if ever there was. "(Publishers) strategy implies that the print model has enough life left in it to make the transition only a matter of shifting money from one pocket to the other. I think many publishers will interpret this strategy as a way to hold onto their jobs while they wait for the combined print and online revenues to match pre dotcom bust earnings. It’s then that they plan to release a big sigh and head back to the golf course." Awards Evenings - How to make them a success. Are awards evenings a busted flush? Do you know anybody in business media who says they would like to go to more award evenings? I must have attended more than a hundred in my career and there are more launched all the time. Two years ago some bright spark launched an awards awards. This was clearly a step to far and the event has not been repeated. In the early eighties, awards evenings were a novelty. I remember guests literally gasping at the splendour of the Grosvenor House Great Room and at the dazzle of a set built from Tri –lite and star cloth in twinkle mode. One of the first awards events I attended was hosted by Michael Aspel and we all bathed in his reflected celebrity. Denis Healey spoke, and, clearly having greatly enjoyed the pre dinner reception and his meal, stood up, pulled what must have been the wrong speech from his pocket and delivered a homily on the IMF to a crowd of computer programmers. He didn’t go down well but the audience, transduced by the glamour of the occasion, forgave the organisers. These days awards are old hat and it is ever harder to dream up new ways of pleasing an increasingly awards literate audience and demanding sponsors. All awards evenings are described on the night as the “Oscars” of their industry but frankly only a few would pass that particular sniff test. Here are my top five tips for running admired and successful awards evenings. 1) Hire a venue that’s too small. There is no better way to increase the kudos and credibility of your event than by annoying people who can’t get a table. Make sure that at least one of the potential guests who can’t get a table is hugely important and the gossip will be, “do you know that tickets were so exclusive that even Sir Rambly Bigcheese couldn’t get in?” It will do wonders for next years ticket sales. 2) Never ever hire an unknown comic to entertain your guests. If you have made this mistake in the past you’ll know why you’ll never do it again. 3) Make your judging criteria and process rigourous and probitious. Never leak the results, never fiddle the result and most important of all get the most credible unimpeachable big wig from your industry to chair the judging panel – that way the losers will blame him, not you, when they lose. 4) Remember that most of the people at your awards are losers and will hate the winners. Throwing a party where most of your guest will leave angry and disappointed can be a challenge when it comes to the following years’ event. Think about how to make the losers have a good time too. 5) Go over the top with publicity in your own magazines. If your own titles don’t think your awards are the most important event of the year, why should anybody else? 6) Under promise and over deliver for your sponsors. Tell them why they are they there. By the end of the evening they will have forgotten and then they won’t come back. And if all else fails come up with an original idea and whatever you do never use the expression, “these coveted awards are the Oscars of the industry. It probably isn’t true and it’s a terrible cliché. This article pubished int he US by Media Post has some key findings that we should all be aware of. First is that tradtional advertising is flat and internet ads are grwoing at 20%. Second is that trade shows work as support medium for internet campaigns and finally, int he high tech sector at least, advertisers no longer care about magazines. Read it and weep, publishers! AD REVENUE FOR BUSINESS-TO-BUSINESS PUBLICATIONS grew 1 percent in the fiscal year ending in June compared to June 2005, the Business Information Network said Thursday. During this period, print ads were flat behind other media as sources of revenue growth--while online advertising posted 20 percent growth and events saw 6 percent growth, compared to last year. The leading categories for B-to-B revenue growth were "building, engineering and construction," which jumped about 8 percent, followed by "automotive" and "resources, environment, and utility," which both grew about 7.9 percent. Mirroring the broader market, the big winner in terms of delivery was the Internet--a development that seems to confirm two recent findings: a study by Forrester Research performed for American Business Media, called "The B2B Digital Marketing Shift," and a study by Harris Interactive. According to the latter study of 588 executives in 21 different business areas, 49 percent said that a B-to-B Web site led them to recommend a product to their organization, and 35 percent said they had made business purchases through the Internet. The Internet appears to work best in conjunction with trade shows, noted the Harris study. Seventy-seven percent of Harris respondents said trade shows drove them to find more information about products or services on the Internet. Plus, direct personal contact appears to be the most effective means of reaching executives. According to Harris, 70 percent of the study respondents said interactions with company reps at industry functions caused them to make or recommend a purchase to their company. Further support for the viability of B-to-B events was provided by a recent study by Outsell, Inc., showing trade shows and expos to be one of the few categories embraced by almost every major section of American business. Per Outsell, biotech and pharmaceuticals led event spending, followed closely by "old economy" manufacturers as well as "new economy" high-tech firms. This finding stands in sharp contrast to online advertising, for example--which has made few inroads among manufacturers and print magazines, which are considered the least effective of all marketing approaches by high-tech executives. Future Publishing have issued another profit warning, their sixth in the last two years. This is beginning to smell like a company in meltdown - again. Future took an enormous bruising in the bursting of the dot com bubble with its reliance on technology publishing. I think this is a company in trouble. Just take a look at its share price (see graph). The acquisition of titles from the bust Highbury House has proved a mistake, with just £800k of EBIT delivered in the first half, compared with an expecatation of £2.5m, the digitial strategy is late and ill co-ordinated and the business is looking in danger of having rather more debt thatn its current level of earnings would make a prudent CEO comfortable with. Search for Web 2.0 Business Media Strategy is at an end. The demise of the deal between Wilmington and Metal Bulletin is bad news for the former. The proposed merger would have delivered little benefit save for scale, but the mid marklet companies in business media, Centaur, Incisive, ITE, Wilmington et al need scale otherwise they will get crushed by the big players and out manouvered by the small. The killer counter bid by Euromoney was judged to be just sufficient to make it impossible for the merger team to respond. Any increase in the relative valuation of Metal Bulletin in the deal would have all but wiped out the value of any cost savings that would have arisen. This aborted deal leaves Wilmnington adrift and looking for a deal. Senior management sources in Wilmington told me before the Euromoney announcement that they expected someone would counterbid. If that's true one wonders why they didn't have a strategy for dealing with just that eventuality. The problem now for Wilmington is that there are not too many firms with whom to do a credible deal. Expect Wilmington shares to underperform. The Guardian excoriates the TES strategy this morning. It appears that double the number of required volunteers have put their hands up for redundancy and there are rumblings of an advertiser revolt. The only think that is surprisiing about all this is that anyone is surprised. The Guardian reports that copy sales are falling at the TES. Well, show me a business or trade mag where that isn't true. It reports that the TES is seeing its recruitment model being disintermediated by the internet. This too is an ubiquitous experience for business publishers. The Guardian also tell us that the journalists don't like it. No journalist I have ever met welcomes editorial cost cutting. There were many investors who glanced at the TES opportunity when it was put up for sale by Murdoch last year and most walked away. The only do-able strategy was cost cutting, and this, although no doubt necessary cannot provide long term growth. The problem that Bernard Gray and his team are no doubt realising is that although cost cuts will improve margin they do no necessarily increase the vlaue of the asset. The shareholders of TES are private equity folk. They will expect a handsome and quick return on their investment. TES are going to have to find some revenue growth as well as some cost fat if that is ever to be delivered. There will be tears before going home time. It doesn't actually. But The Regulatory News Service reports this that Centaur Media has bought the ABTN web site for £100,000. No mistake here - I havene't left off a zero. If you have a look at the site its a weekly monodimensional scribing of random news for the travel industry. It makes no use of any Web 2.0 thinking, it updates only once a week, has little or no advertising that I can see, is poorly presented and presumably makes little or no money. 1) Why bother buying something so small? 2) If you have bought it why announce it through RNS? It looks absurd. 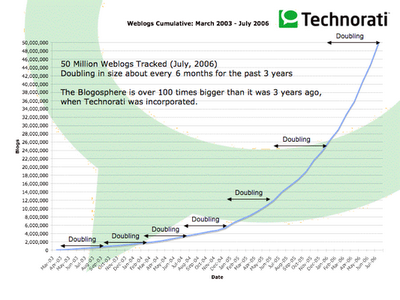 Technorati are saying that they track 50 million blogs and that the size of the blogosphere doubles every 200 days. More blogs are written in the English language than any other, with Japanese a close second. This level of activity has profound implications for publishers. Share of voice is becoming increasingly difficult to achieve in the cluttered blogosphere. How can users discriminate between the reliable and the mad. In business media, where traditionally information we publish has helped inform business decisions, this inability to discriminate between good and bad content is serious. Content discriminating devices such as digg or del.ic.io.us or any of the other kinds of tagging are based on popularity not quality. The best novel ever written is not the Da Vinci Code, despite the fact that it may be rated as most popular content by book readers. The challenge for business publishers resides in delivery of Berners Lee's notion of the semantic web. How can we deliver releavnt and accurate content? Can we, the publishers, edit the web and organise relevant content so that it makes sense to micro commmunitie? Reuters is reporting that business media sales are being aborted due to low prices being offered. This should come as no surprise to seasoned watchers of the UK scene. Multiples have been falling for at least a year as buyers downgrade their growth expectations because of the continuing fall in demand for advertising. We are seeing a rare glimpse of business evolution happening at the speed of light. The old model is dying, but in denial, and the new model, at least in B2B has not yet materialised. There is no doubt that vertical niche business web sites will be the future of the sector but as yet few publishers have got past the notion of a companion website. Search has disintermediated many of the old media brands. For the imaginative and the brave there are rich pickings to be had in world where dinosaurs are dying out. I had missed this little deal. Charles Reed, the patriarchal leader of his familys William Reed seems determined to buy everything he can that is food and drink related. (Although you may recall he lost out on the sale of The Publican last year which was arguably the one deal he should have made sure he won). He has just bought the Meat titles and shows from Graham Yandell. Not much profit here and not much value either I would guess. William Reed already owns the Meat Trades Journal which it acquired last year and runs the Foodex/Meatex show. I don't see a queue of media owners rushing to enter the meat sector. Which strategy and development departments are siiting around thinking up ways to win over more butchers to their reader databases? William Reeds acquisition strategy needs to be cleverer than just buying stuff becasue it is about food and drink otherwise each successive deal will dilute the earnings from their basket of leading products. One of the worlds largest business media companies has begun to settle into into its new life as a private company. VNU has had a troubled recent history with shareholders revolting over strategy and the CEO losing his job. The recent public to private transaction which leaves private equity combine Valcon in charge, will give the company a fresh start. With former UBM CEO Clive Hollick on the board (representing the interests of Valcon partner, KKR and a new US operational CEO in Bob Krakoff (formerly Reed and Advanstar) the firm has some well known business media heavy hitters. One irony here is that Hollick sold much of his Miller Freeman trade show and magazine business to VNU in the period when he thought that he and Michael Green were going to to be the unifiers of ITV. Meanwhile the challenges for VNU have not changed. It has to decide what business it is in. Most experts expect growlers to fall away in a sell off of non core assets. Expect more news from them sooner rather than later. You are probably beginning to think I don't like anything. Well, I certainly don't like this. It may be a good idea to launch a magazine for young accountacy professionals as VNU have announced. It may be an even better idea to make it exclusively available on the web. What is a crushingly bad idea is to design the pages of the web magazine as if they are going to be printed. And anyway, a 12 page thing is not a magazine, it's a pamphlet. A digital pamphlet I'll grant you - but a pamphlet all the same. Have a look for your self. WOB's don't work, the typeface is too small, the pictures under the text make most of the copy unreadable. I could go on. I defy anyone to spend more than 30 seconds trying to read this without going blind and there are better ways of doing that on the Internet. You would think that someone would have mentioned to Porsche that the Cayenne is horribly ugly. They didn't but somehow it was still a success. Someone should have told VNU that this solution is really ugly. They didn't and it will fail. I have already posted that I am deply sceptical of the plan to turn The Business into a magazine. Now we learn that Andrew Neil Expects a circulation of 50000. This is the stuff of fantasy. If fully paid sales exceed 10000 I'll be very surprised. The title will need huge news trade marketing support to achieve even that. In my humble view, this is the bonkers publishing idea of the year.